President Jamie has plans to paint United States maps on up to 11 area elementary school playgrounds and has secured a matching grant to help achieve that goal. Several of our members & friends, interact members and other area Rotarians pulled together to paint this map at Benton Elementary on Saturday, July 18th. 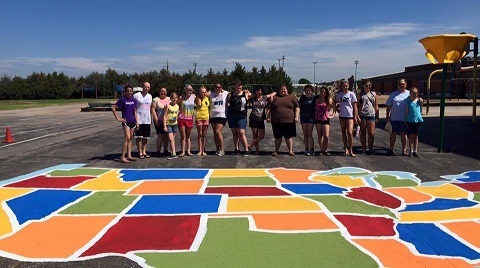 Kansas Rainbow Girls provided volunteers to paint the map on the Clark Davidson Elementary playground.